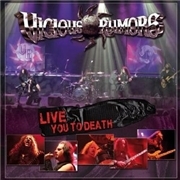 Legendary US metal band VICIOUS RUMORS has definitely not kicked the bucket. 14 live and studio albums on they still soldier on. Some might say that their heyday passed after albums like “Soldiers of the Night” and “Digital Dictator”, which was back in the second half of the eighties, others like me prefer the early nineties and albums like “S/T” and “Welcome to the Ball” etc. But the band has sure struck back with the triumphant “Razorback killers” in 2011. Guitarist Geoff Thorpe has been around since 1979 and drummer Larry Howe more or less since 1986. Bassist Stephen Goodwin came aboard in 2006, vocalist Brian Allen in 2009 and guitarist Bob Capka as late as 2012. 1986 through to 1995 seems like the first period, the aftermath of the tragic death of vocalist Carl Albert marked the years 1995-2006, while the band returned to their classic sound from 2006 onwards. This album was captured on tour with HAMMERFALL in 2011, and how good is it? The pairing of “Replicant” and “Soldiers of the Night” seems to please the crowd, but the audience seems a little bit doctored in the studio. They continue with the third track "Murderball", but even the fourth track “Lady Took a Chance” is from the aforementioned second effort, but that one progresses into “Down to the Temple” off my favorite self titled album. The band seems very tight and the sound is razor sharp, perhaps not live enough for my liking. A bit odd perhaps that they opt for tracks up and to 1990 almost exclusively, with only “Let the Garden Burn” to represent their latest album “Razorback Killers”. But as they go into gear with closing track “Don´t Wait for Me” I have absolutely no complaints… Rounding off are two studio recordings, BLACK SABBBATH´s “Sign of the Southern Cross” and JUDAS PRIEST´s “Running Wild”. It is an enjoyment to hear Brian have a go at tributing the late great RONNIE JAMES DIO. This is a very good live album, but it could use some less controlled live sound.